1988 - The Board of Regents gave approval to offer a master's degree, and the name of the unit changed from "Program" to "Department". 2009 - Dr. Julie Masters succeeded Dr. Kosloski as Chair. In 1968, the Municipal University of Omaha was legislatively merged into the University of Nebraska system and became the University of Nebraska at Omaha, under the governance of the Board of Regents of the University of Nebraska along with the University of Nebraska-Lincoln and the University of Nebraska Medical Center campuses. At that time the Regents established a policy whereby the existing Engineering and Home Economics programs at Omaha would come under the administrative oversight of academic units at UN-L, while Social Work, then a Lincoln program, would be transferred to Omaha. 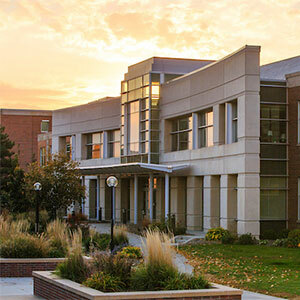 An administrative home was established for Social Work at Omaha - the School of Public Affairs and Community Service, which became CPACS - as well as the Department of Public Administration and the Department of Criminal Justice, which had spun off from Sociology. A Center on Applied Urban Research was also established. It was understood that all CPACS programs would have a "state-wide mission;" thus, Criminal Justice and Gerontology instruction at Lincoln is done by faculty who are paid by UNO. In 1972 the Gerontology Program was established at UNO as a part of CPACS. Here is how that happened: In 1965, the then-newly established U.S. Administration on Aging (AoA) began to administer the Older Americans Act, Title V of which provided funding to establish university gerontology academic programs. The grants were for five years, designed to provide 100% funding the first year and then winnow down by 20% each year. The hope was that the grantee universities would thus put their own hard money in place of the decreasing federal dollars, and by the fifth year the soft money would be completed and the grantee university would fully fund its own gerontology academic unit. The success of this grant program was spotty. Many universities (e.g., the University of North Carolina-Chapel Hill) simply took the federal dollars and then dissolved their gerontology program when the grant was completed. Others (University of Michigan) added strength at already-existing programs. Some (University of North Texas, Wichita State, the University of South Florida) eventually did start up their own gerontology departments that continued after the end of federal funding. At this time, the Association for Gerontology in Higher Education was founded as a lobbying organization to keep the AoA dollars flowing to the member colleges and universities (as one founder said, "It was to keep our noses in the federal trough"). The Title V Career Training Grant program at AoA was run pretty much by one individual, Clark Tibbetts, who had been with the Social Security Administration and was, along with his colleague Wilma Donahue of the University of Michigan, one of the few established scholars in the then-new field of gerontology. I have seen correspondence from Tibbetts in 1970 offering a five-year career training grant to the University of Georgia if they would take his intern, a new PhD from Michigan named David Peterson, to run the program. Georgia turned him down and did not receive the grant. In 1972, Dr. David Peterson became the founding Director of the Gerontology Program at the University of Nebraska at Omaha. It was 100% grant funded at the time, but grants in social gerontology were available to good grant writers. Added to the AoA Career Training Grant (which ran from 1972 to 1980 - beyond the original time limit), several people were supported by a Nutrition Training Grant, which was given to UNO to provide training in the region for people who had been hired by the aging network to run newly-established Title VII nutrition programs for the aged. These were community-based hot lunch programs, many of which have evolved into senior centers. There were many other grants during those years to train staff members of AoA-funded state and local agencies. A small academic program was developed in 1972 - 1973, offering a four-course undergraduate Certificate in Gerontology and a five-course, graduate-level Certificate to people who had received scholarship support through the Title V Career Training Grant (about 20 people in the first year). 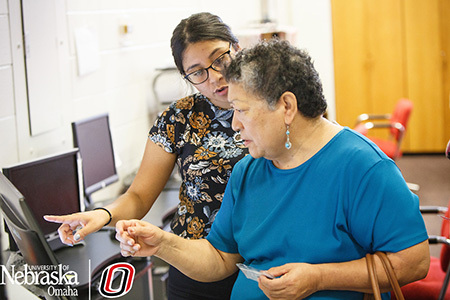 The course offerings expanded as people were added to the faculty, and there were over 100 gerontology students - not all of whom received grant support - by 1977, the year that the Board of Regents gave its approval for UNO to grant the Certificates. The Gerontology Program had formed an alliance with Teacher's College at UN-L, which paid 10% of Peterson's salary, to cooperate in the offering of doctoral degrees for people who wanted to specialize in gerontology. The first two, Christopher Peterson and Richard Citirin, received PhDs in Educational Psychology in 1979. The first recipient of the PhD in Adult Education with a concentration in Gerontology was Elizabeth Baines in 1980. This arrangement continued over the years until 2016. The program eventually became the PhD in Human Sciences with a Specialization in Gerontology, a specialization recognized and approved by the Graduate College at UN-L, and about 60 people received a doctorate as a result of this inter-campus and inter-departmental cooperation. The first state funding was received by the Gerontology Program in 1974. The AoA Career Training grants finally were completed in Academic Year 1979-1980. During the final several years of that funding, the Program offered courses at different centers throughout the state (North Platte, Columbus, Grand Island, Scottsbluff, and Lincoln) giving students an opportunity to receive a Certificate in Gerontology. A professor would go to the site and teach Friday evening and Saturday morning, and a complete cycle of courses could be completed over the course of five semesters. This was done for two certificate cycles at several of the sites, and for a total of three in Scottsbluff. Dr. Peterson left UNO in 1978 to become director of the Leonard Davis School of the Andrus Gerontology Center at the University of Southern California. Chuck Powell and then JoAnne Lofton served as Interim Directors, and Dr. James A. Thorson was selected to succeed Peterson in March of 1979. The program stabilized during those years so that no professor was entirely grant supported; ultimately, all of the full-time faculty became state-supported in tenure-track positions. In 1988 the Board of Regents gave approval to offer a master's degree, and the name of the unit changed from "Program" to "Department" in 1989. Dr. Thorson stepped down in 2007; he was succeeded as Department Chair by Dr. Karl Kosloski. In January of 2009, Dr. Julie Masters succeeded Dr. Kosloski as Chair. In 2011 the Dual Degree in Gerontology and Law was approved in cooperation with UNL College of Law. In 2011 the Master’s Degree approved as two options: Thesis and Non-Thesis. In 2012 the Department offers online programming at the undergraduate and graduate levels. In 2013 the Graduate Certificate in Gerontology with a concentration in design was approved. In 2015 the Bachelors of Science in Gerontology was approved by the Board of Regents and the CCPE. In 2016 the final PhD in Human Sciences with a specialization in gerontology was awarded. And in 2017 the Doctor of Philosophy in Gerontology was approved by the Board of Regents and the CCPE.